Another potential injury could occur if someone tries climbing a tree extending into a power line. The weight of their body may cause a limb to touch the electrical wires, sending electricity from the wire, through the branch, and into the person. The person could be severely injured by the shock, knocked from the tree causing further injury, or killed instantly. To help alleviate these scenarios, the cooperative has implemented a comprehensive tree trimming or right-of-way program. When possible, branches and limbs are just cut back from the lines, but when offending trees are located within 20 feet on either side of the utility line, Farmers’ prefers to remove the tree to eliminate the hazard completely. 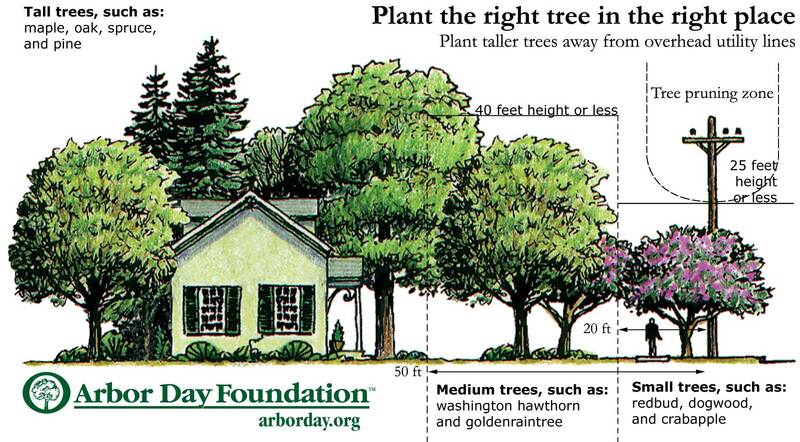 The graphic (provided by the National Arbor Day Foundation) illustrated the appropriate right-of-way for utility lines. to leave the Members happier than we found them, through complete education, superior trimming services, and an effective tree replacement program. If you have a tree on your property with branches in the primary or secondary power lines, then service reliability at your home (or your neighbor's home) will be challenged. Through your Cooperative's Tree Replacement Program, Farmers' Electric Cooperative will remove the troublesome tree while you pick one of four flowering ornamental trees to replace it. The tree will be planted by a local nursery professional at no cost to you. Contact the Cooperative at 660-646-4281 or 800-279-0496 to get additional information.